The lecture will seek to promote understanding of Dante’s Comedy (ca.1307-1321) as an attempt at reconciliation. A poetic text largely conceived and written in exile, reconciliation was a theme as vital to Dante the man as it was to his entire world. Professor Lokaj will guide the audience through two areas in which Dante sought to achieve some degree of reconciliation – the role of women in society and the Western view of Islam. 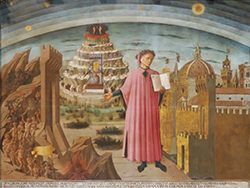 He will do so by looking at Inferno 5, the plight of Francesca, who moves the other-worldly pilgrim to tears and physical distress, and by looking at Paradiso 10, the case of Sigieri, and Paradiso 11, the canto dedicated to St Francis, where the poet attempts to reconcile the Christian and Islamic worlds via discourse, dancing and sheer reciprocal listening. In the case of Francesca, the adulteress, she is damned to Hell but is nevertheless also granted the possibility to spend eternity with her truly beloved. In the case of Sigieri, despite the West’s general condemnation and fear of Islam, Dante chooses to admit into Heaven a man who espoused and promoted the fruit of Islamic philosophical speculation. The lecture, therefore, will present the Comedy as an attempt to act as an iconoclastic model of how reconciliation between supposedly irreconcilable and irreducible positions can indeed be achieved, first of all in the afterlife sanctioned by God then, hopefully, also in the here and now. Rodney Lokaj is Australian by birth and in his early studies, but European and specifically Roman in his final training under the classical philologist, Giorgio Brugnoli. He received his PhD in medieval Italian studies at Edinburgh and taught medieval and humanistic Latin literature at the University of Rome, La Sapienza, until recently when he was called to the chair of Italian philology at the University of Enna “Kore”, Sicily, where he teaches Latin language, medieval Italian, Italian linguistics and grammar, and, of course, philology. His research and publishing regard the later Middle Ages with an emphasis on medieval Latin and early Italian works, primarily those by Saints Francis and Clare of Assisi, Dante, and Petrarch. His more recent research has been carried out in Renaissance literature with a princeps edition of the Latin poetry by Baldassarre Castiglione, the author of the Book of the Courtier, and Domizio Falcone, a poet rediscovered by Lokaj himself in the Vatican Library. Regularly invited throughout Italy and abroad to speak on these topics and more, he sits on the editorial board of several leading journals as well as on the executive council of the American Association of Neo-Latin Studies. He currently directs three international teams dealing with the deciphering and publishing of medieval and early-modern Latin texts, one an entire medieval Franciscan library in Sicily, another the fifteenth-century correspondence between the kings of Poland and the doges of Venice and, lastly, newly-discovered Dante fragments unearthed after the most recent earthquake in central Italy.